Our Southfield Adult Martial Arts classes will get you in great shape, teach you the top techniques for safety and self-defense, and help you feel accomplished, focused, and full of life. 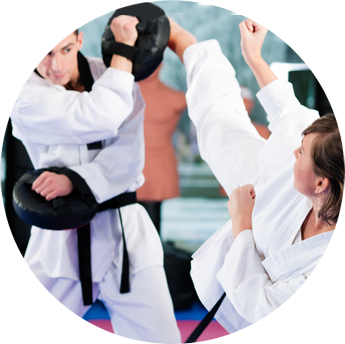 Train like a pro in both armed and unarmed methods of combat through our martial arts classes for anyone who's ever been interested in self-defense, karate, or simply getting fitter. Our community of Southfield men and women is extremely welcoming and supportive, helping you finally reach your goals. Southfield, MI. Southfield is a city in Oakland County of the U.S. state of Michigan. It is a northern suburb of Detroit. As of the 2010 census, the city had a population of 71,739. A part of Metro Detroit's upscale office market, the city's marque is a cluster of five golden skyscrapers – known as the "Golden Triangle" – that form the contemporary 2,200,000 square feet Southfield Town Center office complex with a Westin Hotel and a conference center. In addition, a 33-story luxury residential high-rise is separate from the complex. To the west, near the confluence of I-696 Lodge Freeway, is the American Center. Southfield, MI with surrounding areas in Franklin, Bloomfield Hills, West Bloomfield, or Birmingham , is home to Dallo Martial Arts, a Martial Arts facility focusing on programs in Adult Martial Arts.